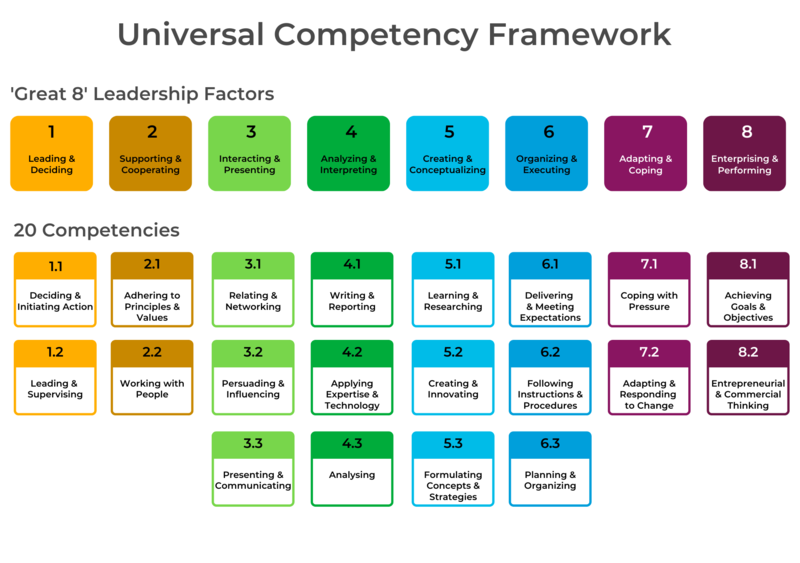 Universal Competency Framework (UCF) provides a rational, consistent, and practical basis for understanding people’s behaviors at work and their likelihood of succeeding in certain roles and environments. We constructed the UCF from our wide-reaching program of research on workplace behaviors, so it can be used to build competency models for all types of jobs or to map existing models onto a universal set of competency components. We also provide a full suite of talent management tools and content to support the UCF, including questionnaire items, behavioral anchors, interview questions, and assessment exercises for employee selection and development. These provide the source materials for building assessment programs. Most importantly, each competency component is linked to our portfolio of assessments. A competency framework allows organizations to align individual behaviors to group or corporate goals. It specifies the requirements for good performance in a given role, thereby facilitating end-to-end talent management practices, from identifying job-relevant competencies to engaging talent assessment tools to managing performance.